On the surface it may seem as though storytelling and circus have little in common, but in fact the two art forms share a surprising number of similarities. Both are known for taking place under big-top tents, as anyone who’s attended our National Storytelling Festival can attest. But on a deeper level, both storytellers and circus performers embody living cultural traditions—skills and secrets that have been passed down carefully through generations, but also new and emerging forms that are being developed every day. This year ISC took part in the Smithsonian Folklife Festival in Washington D.C. (Click over to our president’s blog for a more detailed report.) One of the themes the Smithsonian folks explored in depth this year was circus arts, going so far as to erect a big-top tent on the National Mall. It’s striking to think about how, even when art forms feel connected, each has its own history, tradition, and culture. The circus arts exhibits included performances, demonstrations, and workshops, not just with the artists, but also with the people who support them—costume makers, makeup artists, musicians, chefs, directors and choreographers, and other laborers. The circus is also a rich builder of its own community. As these huge productions traveled from town to town, mostly on covered wagons, circuses formed their own little self-contained worlds. Many companies had to hire their own service providers like barbers, teachers, doctors, and vets to travel with them. Chefs were hugely important, making nutritious food for people who are essentially world-class athletes. At one point Ringling Brothers staffed more than 100 cooks! Looking at the different acts and performance styles over the centuries paints an interesting picture of folk life here and abroad. The art of acrobatics dates back to ancient times, but other aspects of circus are much more recent innovations. 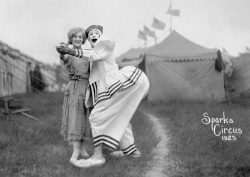 Clowns have been a part of modern circus from the early years, though they began as humorists whose work was geared towards adults, not children. Trapeze, a French innovation, didn’t come along until around 1850, but it has since become an iconic element of the show. A look at contemporary circus acts demonstrates how some traditions have fallen out of fashion. The Smithsonian’s Folklife Festival, for instance, did not include any exotic animals, to the applause of animal rights enthusiasts. Styles, too, have changed, as is evidenced by the popularity of avant garde forms of circus such as Cirque du Soleil and Cirque des Voix, a company known for working with a live orchestra. The latter performed at the Folklife Festival. the Bindlestiff Family Circus, which is based in New York City; and Dolly Jacobs, an American aerialist. Jacobs has spent her entire life among circus folk, including her father, who was known worldwide as the face of the Ringling Brothers and Barnum & Bailey, and her mother, who was a dancer. She was literally raised on a train, not just by her parents, but by the circus community, who taught her to speak Bulgarian, Spanish, Polish, and German. 2017 is in many ways an exciting time in circus, with more and more grassroots organizations and innovative acts springing up across the nation. But at the same time, circus as we know it is undeniably in decline. In May 2017, Ringling Brothers and Barnum & Bailey Circus ended their 146-year run with a final performance on Long Island. Many people consider the business model of large circuses outdated, so smaller troupes are becoming the norm. Practitioners are also exploring new and interesting applications outside of entertainment (something we pursue in storytelling, too). The Folklife Festival invited an interesting range of circus folks who have found applications for their art form. We were fascinated to learn about Circus Juventas, a nonprofit performing arts youth circus that helps build teamwork skills and self-confidence in kids; Quat Props, an organization that adapts juggling equipment and techniques for people with disabilities; Wise Fool, a group of women activists from New Mexico who promote social justice; the Medical Clown Project, which performs for people who are sick; and Clowns without Borders, a group that brings much-needed laughs to refugee camps, conflict zones, and natural disaster areas around the world. Is the circus really the greatest show on earth? We’re not sure—we’re still pretty sweet on storytelling. But it’s certainly among the greatest shows on earth, and we’re grateful to the folks at the Smithsonian Folklife Festival for giving us the opportunity to learn more about this fascinating art form. It’s exciting to see our friends across the arts celebrate and preserve their own traditions—a kind of work that resonates deeply with our own values and mission here at ISC.